This weekend the traditional Bear Pit tourneys were held at Market Day at Birka. The format is a 10 foot by 10 foot list. Combatants can be killed according to the usual rules of combat or by being driven out of bounds of the list with both feet. A single foot out of bounds results in a wound. The victor remains in the list to take on the next comer, retaining any wounds they may have received. The scoring awards 2 points for a win, 1 point for a loss, and 1 point each for a double-kill. The scores for all participating fighters in both the heavy list and fencing tourneys can be viewed there. First place in the heavy list tourney went to Douglas Henry, followed by Arne Ulrichsson and Matthew Moravaeous. All three are members of the Order of the Chivalry. The Fencing Tournament was won by Tora Taka, followed by Gabriel Roberts and Cassius Pontianus. The amazing number of fights packed into three hours is a result of the Minister of the Lists having access to a sophisticated scoring database, and entry to a crew of dedicated volunteers, enabling the losing combatant to report their loss, and their victorious opponent’s win, and get back into line to fight again in under a minute. For the Youth Combat Tourney, Diana the Mighty won Division I and Leon Griffin won Division III. Xavier, also from Division III, won most chivalrous of the list. The following tournament results are available from the oxhide bear-pit style tournaments traditionally held at A Market Day at Birka. Heavy list comtat at A Market Day at Birka. Photo courtesy of Countess Caoilfhionn. 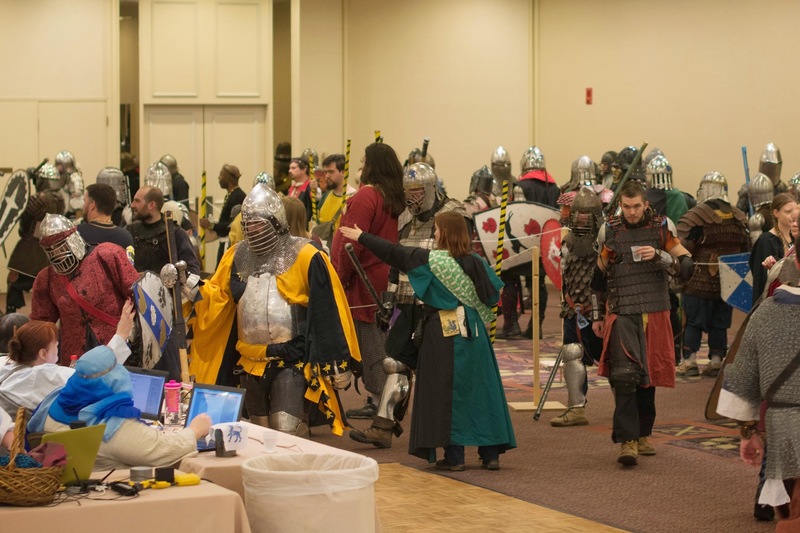 At Her Majesty’s whim, a Youth Rose Tournament was held before Crown Tournament this past weekend. For those unfamiliar with youth combat, it is run much in the style of adult combat. Each fighter was sponsored by a Lady of the Rose, or a few Ladies of the Rose. The tourney was run as a bear pit. When a fighter won a bout he brought his Rose or Roses a rose, and returned to the list to fight the next combatant. The honor and chivalry of the young fighters was so inspiring that it caused Baroness Aneleda to set words to paper in commemoration. 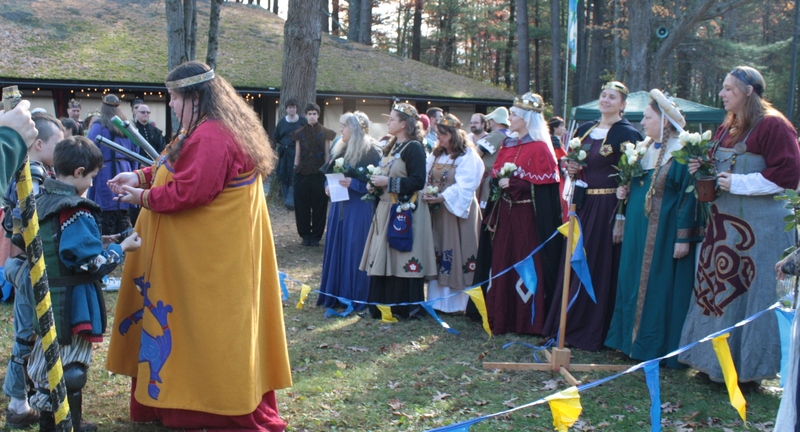 An Account of the Youth Combat Tournament at Crown Tourney, on the Feast Day of All Souls in Carolingia, as seen by Baroness Aneleda Falconbridge. 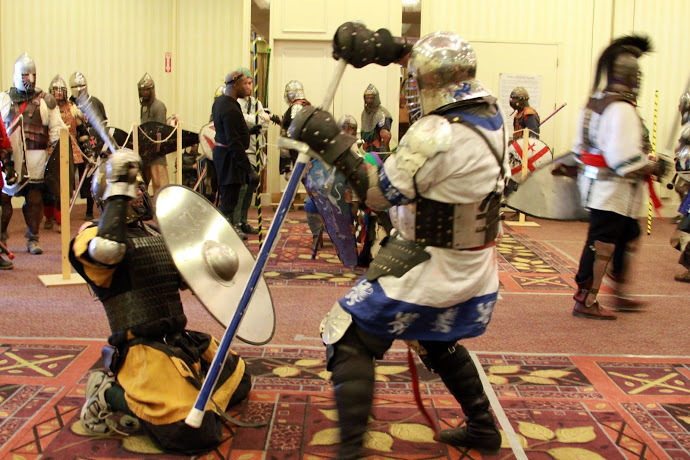 Results from both Chivalric and Fencing Tournaments at the 2013 Market Day at Birka have been posted to the Northern Army website. Vivat to Kenrick of Warwick who placed first in the Chivalric bear pit, and to Quintin Brilliant who placed first in the Fencing Bear pit. Congratulations to everyone who competed!